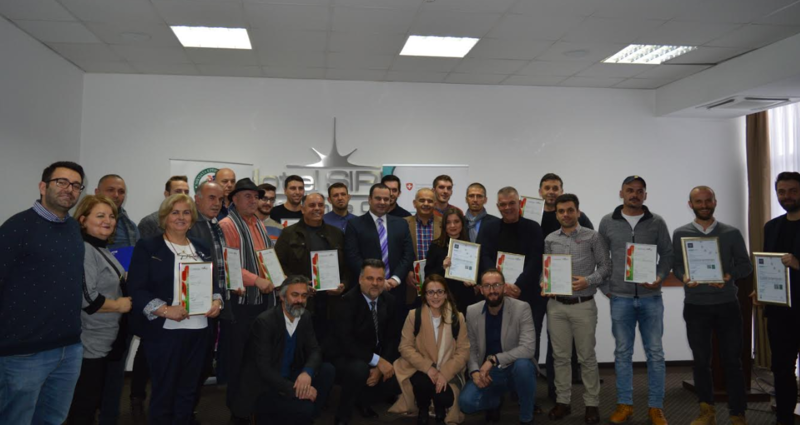 The ceremony for the distribution of certificates for "Organic Certification" for 25 Kosovo companies dealing with the collection and processing of non-wood forest products as well as the cultivation and processing of medicinal aromatic plants was organized on 19 December 2018. The ceremony was organized by the ORGANIKA Association, which for years now is implementing the activity for the promotion of organic certification for these local companies. The organic certificate issued by the Albinspekt Certification Body is proof that these products meet the quality standards and increasing the trust of buyers and consumers. "The organic certification is a powerful marketing tool, as it assures buyers the product adheres to high quality standards and it increases the value of the product," says Faton Nagavci, Executive Director of the ORGANIKA Association, as he talks about the importance of this certification. The activity for the promotion of organic certification of companies in the sector of non-wood forest products and medicinal aromatic plants implemented by the ORGANIKA Association and is supported by PPSE.